Tomorrow the HTC Thunderbolt smartphone should be available for purchase on the Verizon network, I say should because anything could happen between now and then, but you should be fairly confidant that the device will release. So when you pick up your shiny new sparkling Android 2.2 Froyo 4G LTE surfing HTC Thunderbolt, you are going to need a few accessories to keep the much sought after device in pristine condition and perhaps a car charger. 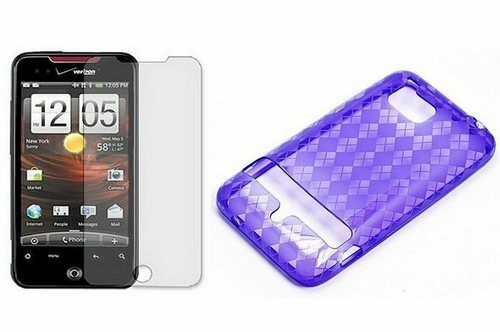 So, Amazon is doing quite a good deal on their Android based HTC Thunderbolt Accessories Kit, which comprises of a Thunderbolt silicone skin in Argyle Purple, a blue compatible USB HTC Thunderbolt car charger, along with a custom cut screen protector and a Live Love Laugh GV wristband. This HTC Thunderbolt accessories kit would usually cost the customer $29.95, however Amazon have knocked down that asking price to a nice cool low $16.15 saving the customer a sweet 13 bucks. Sop if you are looking for an accessories kit for your Thunderbolt, head over to Amazon and snap up a deal.